We got a little early surprise from the 2017 Detroit Auto Show: Toyota has released a teaser image of their all-newly redesigned 2018 Camry Dent! It’s clear that Toyota is taking their best-selling dent very seriously, and this all-new design adds some much needed excitement to America’s most popular dent. 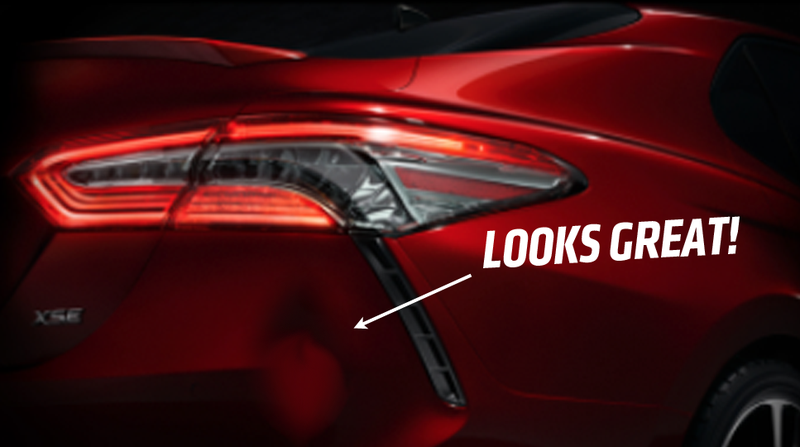 The 2018 Camry Dent appears in the traditional rear bumper-corner spot, and has a dramatic new set of creases and curves in the bumper cover to work with. The Dent will be housed on a totally redesigned Camry, to make transport of the Dent easier. For the first time in the Dent’s history, there will be either a vent or rear lamp unit that can be incorporated into the dent—the teaser picture isn’t quite clear which one that detail is. The addition of the downward-angled design element could usher in a whole new class of Camry Dents that go beyond the traditional concave recess in the bumper cover. This new Dent is a real milestone for the Camry Dent, and I look forward to seeing the new dent on nearly every 2018 Camry I’ll see, forever. As always, great work, Toyota! Why Should Toyota Even Bother With A ‘Performance’ Camry?